Encourage her artistic creativity, they say. Let her bake and cook if she wants to, they say. What they don’t say is how to get her to clean up. What they don’t offer is to come over and clean up for, or even with her. Oh no, they just want to see a child in her peak creativity mode. Admire her crafts and eat her baked products. I’ll spare you a picture of the kitchen where she baked peanut butter cookies. I had to step out for a half hour and when I came back the kitchen looked worse than when I left. I mean, I get that cooking and baking is messy, but at least, if you stack things, or leave them all in one location (like in, or next to the sink) it makes cleanup a tad easier. But no. The giant kitchen island counter is covered in all the debris and dishes and cutlery and crumbs and flour and measuring spoons and bowls. The sink is full of bowls. The side counter above the dishwasher is full of stuff. Where’s the girl, you ask? She’s on the couch with a guinea pig on her lap. Some people have crafting rooms. Some people have rec rooms dedicated to crafting kids (or adults). We don’t have this. We do have a basement but the girl child has a tendency to want to be up near me, up by the natural light flooded main floor and the big screen tv. I try, I really do, to turn a blind eye toward it. I try to let her go back to her crafts, on and off, over the course of a weekend. But to me, the communal area where I do most of my living should be at least somewhat tidy. 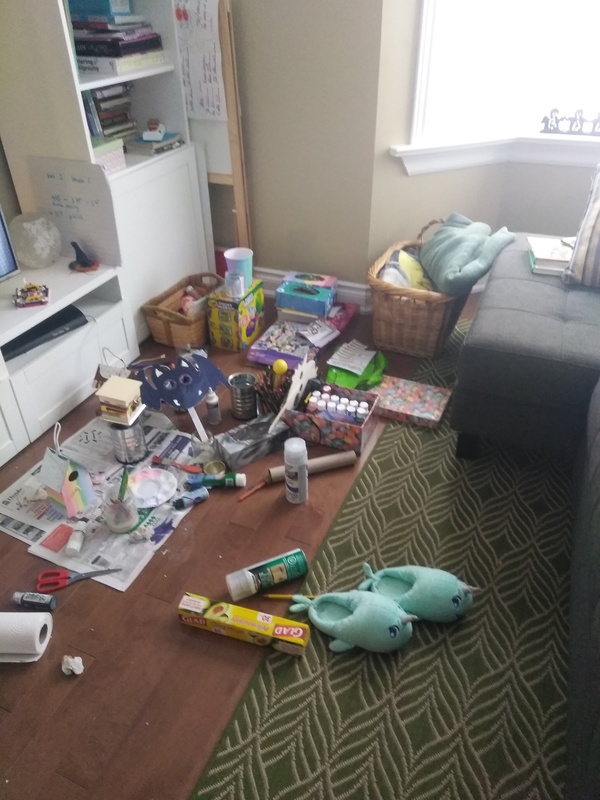 I mean, I appreciate she left the stuff in mostly the corner of the living room and not all over the living room, and unless I need to get something out of a cupboard above that area, it’s not crucial she clean it up immediately. But I also try to encourage the ‘clean as you go’ mantra. To me this is more than just common courtesy; it’s a life skill. How quickly do things in a small house get out of control? Saturday night, both kids are at the rink. Tomorrow morning, same. The rest of Sunday she’ll probably want to continue her painting and crafting, which is fine, until it’s time to get supper on and prep for the upcoming week. At which point I will expect, even demand, she put everything in a bin or a box. Wednesday is Halloween. She’ll bring in two bags and two bins full of costumes and related items for the party at school, and the dance. Not to mention the trick or treating later in the evening. If she doesn’t clean up her crafting in the living room where will she sort and count her Halloween loot? There’s only so much space. It’s still only Saturday. She’s still at it, now, with her painted bird houses and witch things. And will be tomorrow after her game. But by tomorrow night, before it starts to get dark, there better be some pro-activity to get the house back in order. I need my space empty and clean. I don’t do well with clutter first thing on a Monday morning prior to my first cup of coffee. 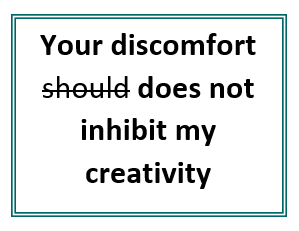 Yes, I was one of those who wrote “encourage her creativity.” I’m just thrilled that she is being creative rather than spending her time on the phone or computer. Do I have an answer? I can only think of your threatening to take something away from her in her craft stash (something she really really needs) if she doesn’t clean up after herself. And then following through if she fails to follow the ultimatum. Maybe a little too harsh? Good luck. I’m glad you vented here rather than to her. For the record, I like clean and neat, too, and pick up as you go/finish. My mom taught me to clean as I go. Or maybe it was dad. They were both a couple of cleanfreaks. Like, almost weird about it. Like we cleaned the house the night before mom had the maid come in to clean the house. 🙂 So funny your parenting posts are entertaining reading, I guess all I can add, is still to this day remember making things with my mum…………….. 😀 no doubt she cleaned the mess up!!!! Let her imagine that she is the leader of her doll kingdom and she must set a good example which may give you some peace of mind on Monday morning. Maybe you can encourage her to like being a teacher or an “instructor” like your hubby and tell her to pretend to teach or instruct her dolls and then clean up, so they learn properly. I’m open to all tips!